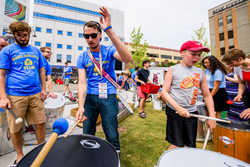 With a series of hands-on experiences designed for festival goers of all ages, Mile of Music is set to return to Northeast Wisconsin August 4 with added Music Education Events. These include workshops and jam sessions that will introduce attendees to new instruments and musical styles and allow them the chance to join in and be part of the band. We want to provide attendees with exciting opportunities to explore their inner musician, and this is done dynamically through active music making. As final preparations are being made to welcome 240 emerging artists to perform 800-plus live sets of original music from August 4-7 at Mile of Music in Appleton, Wisconsin, festival organizers are also busy coordinating the expanded schedule of Music Education Events. These workshops and “jams” have been a staple of the festival since year one (it is now entering its fourth year and being referred to as Mile 4) and have become a favorite experience for the fans. They allow festival goers of all ages and skill levels to get involved with the music-making by way of singing, dancing and experimenting with a variety of instruments. Mile 4 workshops explore everything from acoustic guitar to fiddle, ukulele and Didjeridu, and there is even one designed for back-up singers. Jam sessions will be held for jazz, brass, funk, rock and garbage (recycled treasures) bands. The Music Education Events are headed up by Leila Ramagopal Pertl, music education curator for Mile of Music, and they are coordinated with the help of 15+ dedicated music experts who are connected to Lawrence University and the Appleton Area School District. The team also features the expertise of two local middle schoolers who play multiple instruments and will help lead some of the sessions. This year, the Music Education Team will be collaborating with NAMI, Mile 4 musicians and local musicians for a stirring session that focuses on the power music has in confronting the challenges of mental illness. Sara Devine of Expressive Therapies will be back leading an all-abilities drum circle with adaptive instruments provided. To further emphasize music education in the community, proceeds from Mile of Music support, in part, the Mile of Music Education Fund within the Appleton Education Foundation. Music Education Events are supported by the Community Foundation for the Fox Valley Region, Inc., Lawrence University and Jewelers Mutual Insurance Co. The Mile of Music is an artisan, original music festival that kicked off in August 2013. In its first four years, the festival has quickly flourished. It brought 200 bands and solo artists to Downtown Appleton in 2015 alone, with 750 live music sets performed. The collaborative event was co-founded by Appleton marketing executive Dave Willems and Appleton/Nashville-based national recording artist Cory Chisel, with support from more than 100 community organizations and sponsors as well as 300 volunteers. For more information, visit http://www.mileofmusic.com.